Application of pickling tape prior to the repair of damaged paint. Using self-adhesive tape can simplify the process of pickling aluminium surfaces. It is safer than existing treatment methods involving pickling pastes, sprays or baths, because there is no rinsing stage and hence no need for complicated wastewater disposal. 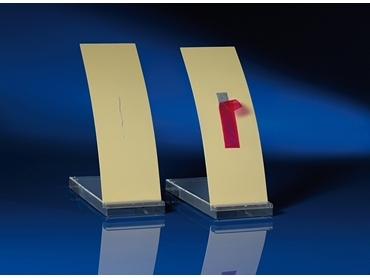 Adhesive bonding is becoming increasingly popular as a means of joining lightweight metal components. But aluminium cannot be coated or bonded without an appropriate pre-treatment to remove undefined deposits of oxides, hydroxides or other contaminations that are almost always found on technical aluminum surfaces. Pickling is one of the most common techniques employed for this purpose. It involves immersion of the components in a solution of chemicals that dissolves the contaminants and provides a perfectly clean metal surface. The use of a pickling bath is difficult when dealing with large components that only require treatment of part of their surface, or when components are being reworked or repaired. Local pre-treatment methods are increasingly preferred in such cases. Manufacturers mainly use pickling agents in paste or spray form, which are spread or sprayed onto the metal surface manually by trained technicians. The problem is that the chemicals employed are strongly acidic or alkaline. Consequently, the surrounding areas of metal have to be carefully masked off. A subsequent rinsing stage is required to remove the pickling agent, and the corrosive wastewater has to undergo special treatment prior to disposal. “None of the currently available local pre-treatment solutions is entirely satisfactory. That’s what led us to the idea of developing a pickling tape that can be easily applied to the areas that require pre-treatment,” says Dr. Malte Burchardt at the Fraunhofer Institute for Manufacturing Technology and Advanced Materials IFAM. The team developed a new adhesive for the pickling tape that would enable it to be applied as easily as any other self-adhesive tape and removed without leaving any residues. All of the chemicals required for the pickling process had to be integrated in the adhesive. Practical tests have demonstrated that the new technology is just as effective as conventional bath pickling and alternative paste or spray methods. And unlike existing techniques, it doesn’t produce corrosive wastewater requiring special disposal measures. The treated component merely has to be wiped clean with a damp cloth after the pickling tape is removed.